Snow-covered deserts are rare, but that’s exactly what the Moderate Resolution Imaging Spectroradiometer (MODIS) on NASA’s Aqua satellite observed as it passed over the Taklimakan Desert in western China on Jan. 2, 2013. Snow has covered much of the desert since a storm blew through the area on Dec. 26. The day after the storm, Chinese Central Television (CNTV) reported that the Xinjian Uygyr autonomous region was one of the areas hardest hit. The Taklimakan is one of the world’s largest—and hottest—sandy deserts. Water flowing into the Tarim Basin has no outlet, so over the years, sediments have steadily accumulated. In parts of the desert, sand can pile up to 300 meters (roughly 1,000 feet) high. 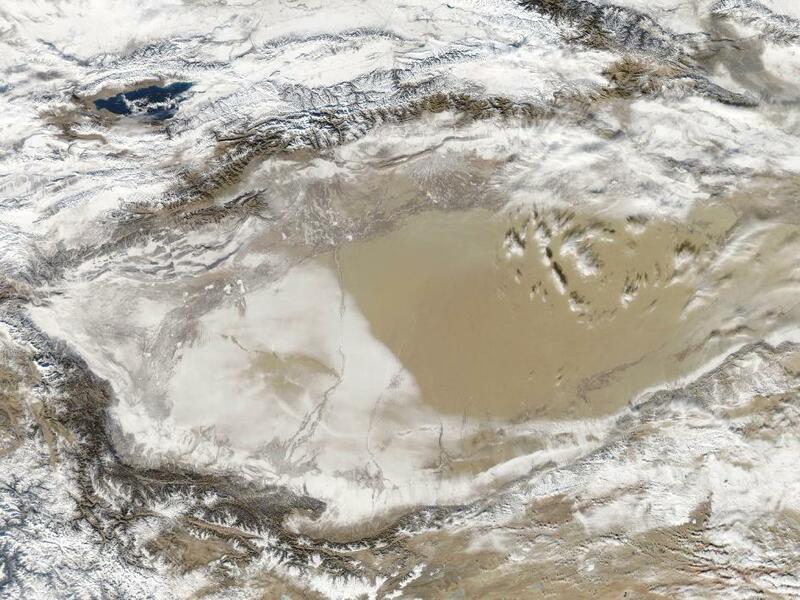 The mountains that enclose the sea of sand—the Tien Shan in the north and the Kunlun Shan in the south—were also covered with what appeared to be a significantly thicker layer of snow in January 2013.